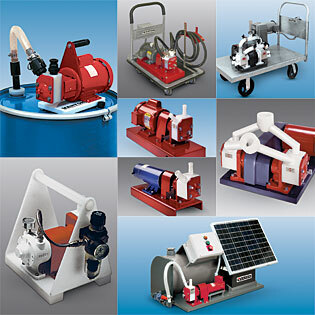 A state-of-the-art facility replaced air operated diaphragm pumps with FLEX-I-LINER Duplex OEM pumps for metered transfer of corrosive, hazardous and toxic chemicals (nitric, sulfuric, phosphoric, hydrochloric, hydrofluoric, chromic acids, acid salts, caustic solutions and solvents) from portable tanks to finishing tanks. The sealless, self-priming pumps are comprised of a UHMW body block, replaceable Neoprene flexible liner, all of which are inert to the fluids being pumped. A major international supplier of medical devices uses these FLEX-I-LINER® OEM pumps for discharge pump stations that transfer a 50 percent solution of hydrogen peroxide from holding tanks to portable containers at 7 gpm (2 m3/h). The pump body block is of solid polypropylene and the rugged, flexible liner of Natural Rubber, both of which are inert to the fluids handled, eliminating corrosion of the pump and contamination of the fluid. Self-priming, run-dry capability allows intermittent operation, while the sealless design prevents leakage. These non-metallic Pump/Tank Carts employ self-priming, sealless FLEX-I-LINER® OEM pumps from Vanton to transfer wastewater and caustic/acidic chemicals with no corrosion. All fluid contact components of the tank, base plate, and secondary containment chamber are of solid polypropylene, precluding chemical attack across the entire pH range. 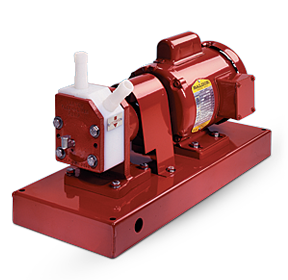 The pump utilizes a rotor mounted on an eccentric shaft to push fluid trapped between a flexible elastomer liner and a solid thermoplastic body block at flows to 2 gpm (.45m3/h), pressures to 25 psig (1.72 bar) and temperatures to 185°F (85°C). The self-priming design has no seals to leak or valves to clog and can run dry without damage. The rigid body block is molded of solid polypropylene, and the flexible liner of Hypalon® flexible elastomer, eliminating corrosion associated with metal pumps.